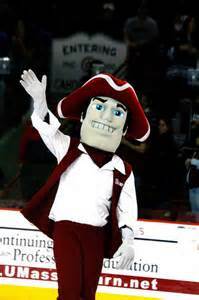 In a Chicago Tribune article, Critics Hope Clock Runs Out On Minuteman, students ponder UMass Amherst's mascot Sam the Minuteman. "If you're a woman or a person of color, he really can't represent you," said Martin Jones, a 24-year-old undergraduate and one of the leaders of the student protest movement. He would like the school teams to be called the "Liberators," symbolized perhaps by a "torch of liberty," which could philosophically encompass everything from abolition to women's rights. And unlike many school symbols, they note, it would not exploit animals. Amherst changed their Mascot three times from Statesmen to Redmen - and now, Sam the Minuteman. However, this revolutionary symbol of a militaristic, gun wielding revolutionary mascot seems out of step for today's sensitivities. While the UMass Chancellor David Scott initially indicated he was open to discussion on the subject, he decided to put things on hold after angry alumni phoned in to protest any changes and local and Boston media swarmed on campus to cover the story. Scott said he wanted to wait until the issue cooled off before opening a "formal forum" for debate - (i.e. he was hoping this would go away so he would not lose massive alumni donations). The 'issue' seems to be driven by the sensitive few. While alumni phone calls have been overwhelmingly in favor of keeping the Minuteman-149 out of 150 calls, most of the school's 23,000 students seem unmoved by the issue. Perhaps one solution lies cross-state, in Cambridge, where Harvard. "Maybe we should be like Harvard," Sherbin suggests. "Just have a name, no mascot." We've lived through this same issue at DU. Same story - different university.